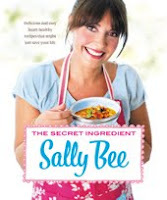 THE SECRET INGREDIENT: DELICIOUS AND EASY HEART-HEALTHY RECIPES THAT MIGHT JUST SAVE YOUR LIFE by Sally Bee came about as a necessity. At 36 years old, Ms. Bee suffered three major heart attacks in a week. She wasn't a drinker or smoker, and she appeared to be fit and healthy. Yet, she found herself fighting for her life. When she arrived back home from the hospital, she knew she had to make some changes. As a mother of young children, Ms. Bee decided that family dinner time was going to be a priority -- she wasn't sure how much time she'd had left. She decided to make healthy dishes that her entire family would eat; and five years later, she is healthier than ever before. Her cookbook THE SECRET INGREDIENT contains many of those recipes that she created for her family. I really enjoyed THE SECRET INGREDIENT. There are lots of healthy recipes (ones that I would cook for my family), and the colorful pictures are an added bonus. Ms. Bee begins the cookbook by telling her personal story, and I have to admit it's a terrifying (yet inspiring) one. Besides the recipes and testimonial, she also gives some helpful hints for healthier cooking and food substitutions. The cookbook is divided into sections for Soups and Starters, Salads, Sides & Vegetarian, Chicken, Fish, Beef, Lamb & Pork, and Desserts. My favorite section was the Chicken one -- probably because it is the one that fits best with my family. (I swear we eat some type of chicken dish about 4 nights a week.) There are quite a few chicken dishes that I plan to try along with some yummy-sounding dessert recipes. The ones that most appealed to me used fresh fruits like Tarik's Apple Puff Squares and Crunchy Rhubarb Crumble. The cookbook was originally self-published in England where it went to #1 on Amazon UK's food and drink best-seller list. I have to warn you that many of the cooking terms and directions contained British words that I wasn't exactly familiar with. It really wasn't an issue because all of the recipes were converted to include American measurements (and terms), but I did find it kind of interesting to see all of the differences in our languages. I swear I wanted to start calling zucchini courgettes. I decided to try the Chicken Risotto Parcels. The recipe is for one serving but you can adjust it to make as many "parcels" as you need. Basically, you take a piece of foil and add a chicken breast, some veggies, some rice, some broth, and some seasonings; and then you bake it. The rice soaks up the liquid and creates the risotto without all of the time-consuming stirring. 2. Prepare a large piece of foil by folding it in half to give extra strength. 3. Mix all the ingredients together in a large bowl. 4. Pile all the ingredients into the center of the foil. Fold up the sides to produce a bowl effect and fold over the top to seal the edges securely. 5. Place on a baking sheet and cook for 45 minutes, or until the chicken is cooked through and the rice has absorbed the stock. I thought the recipe was pretty simple. I made the entire recipe in about 10 minutes so I definitely think that classifies as a quick and easy meal. I even got to use the fresh thyme from my husband's garden. Despite the ease of preparation, I have to admit that we were underwhelmed with this recipe (except for Booking Son.) We thought it was kind of plain and a little dry. It actually felt like I cooked everything too long, and I wonder if the recipe would have been better if I had added garlic and more seasonings -- it just needed more flavor. I should add that I used Perdue Perfect Portion chicken breasts which do cook faster than normal breasts and I didn't adjust the cooking time -- so that could have been part of the problem. I do like the concept of this recipe, but I think it needs a little bit of doctoring. Despite having to get used to many of the British terms, I thoroughly enjoyed this cookbook! I recommend it if you are looking for a healthy family-friendly cookbook. I'm so sad it came out disappointing. Risotto is one of my favorite foods! The idea of it the recipe is sound I wonder about a little less baking and lot more seasoning. I'll have to see if my library has this book. It sounds like it has some good ideas that I could build on. What an amazing story! I do like the idea of the recipe - it might have to try to modify it. That is nuts! Three heart attacks? Scary stuff. I perked up when I read the word "risotto" which is my favorite food in the whole world. But I love making risotto the old-fashioned way. It is like meditating for me. I go into a zen state. Wow this woman's life is amazing and since heart disease runs in my family I am pretty intrigued by this one.